Floyd Mayweather doesn’t just have a killer instinct in the ring, he has it for bling, too. The super featherweight wasn’t holding back any punches when he purchased Jacob & Co.’s Billionaire diamond dial luxury watch. 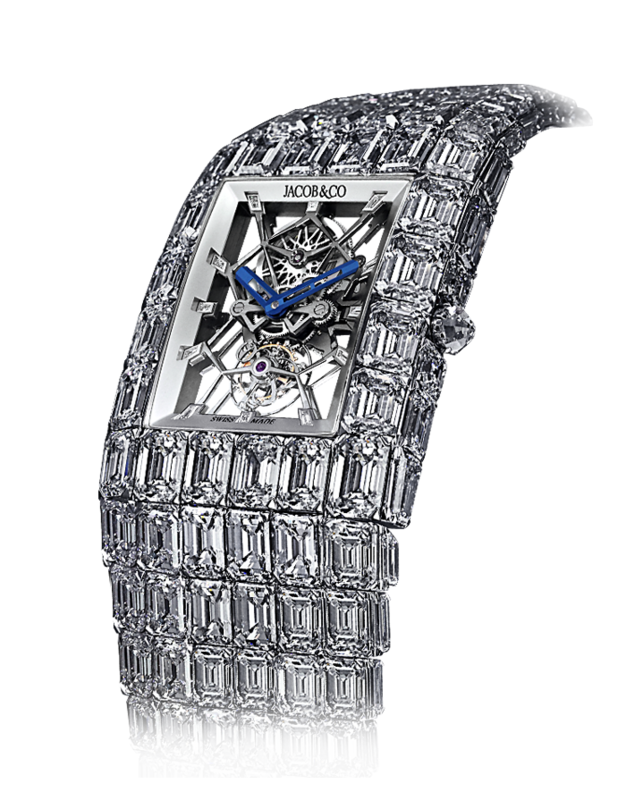 Not only is it iced-out with 260-carats of emerald cut diamonds, it only set the boxer back a cool $18-million. That multi-million dollar price tag is certainly just chump-change for the boxer. To put his wealth in perspective, in the Mayweather-McGregor fight, he earned $275-million in just 36 minutes. On top of that, Forbes has already named him the top earning athlete in the world for 2018 (which he’s held for several years, anyways). Now, while we just saw Mayweather flashing this blingy watch on his Instagram a few weeks back, Jacob & Co. introduced the watch at Baselworld 2015. It’s a one-of-a-kind timepiece that Jacob Arabo crafted alongside his other company, Billionaire Lifestyle SARL. “Created as a unique piece, the Billionaire Truly epitomizes the brand’s passion for breaking boundaries,” the site explains. 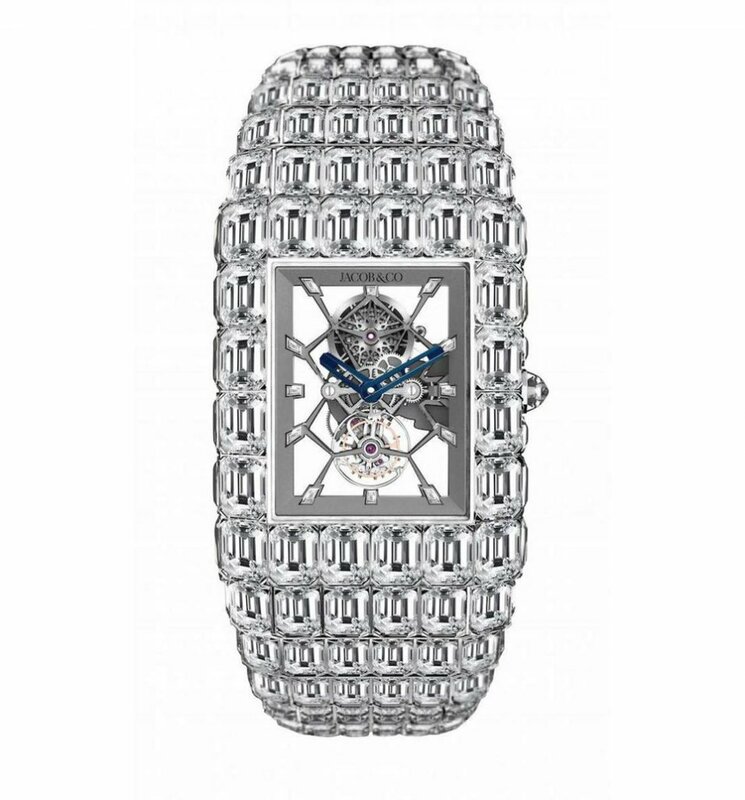 Each of these 260 diamonds are set in an inverted pyramid style — with nearly the entire 18-karat white gold square case and bracelet decked out with diamonds. Some of the diamonds weigh us much as 3-carats a pop. If you can get past the stellar exterior, you’ll notice a skeletonized manually-wound JCAM09 caliber inside that diamond-encrusted case. It’s a tourbillon escapement with a 72-hour power reserve that stays in motion on the wrist constantly. Upon inspection you’ll realize that while this part of the watch isn’t decked out in diamonds (besides the small hour markers) the dial with blue-steel hands is incredibly elegant. The watch is quite fitting for Mayweather who is known for purchasing and showing off extravagant accessories. But, it does make us wonder who else in the top one-percent would be willing to shell out that kind of cash for such an extravagant timepiece. After all, you could buy a pretty great yacht for that price. What do you think – would you shell out $18-million for one?